CARRISSA FURTADO - TRA-BROCKTON YPP SUCCESS STORY | Training Resources of America, Inc.
My name is Carrissa Furtado. 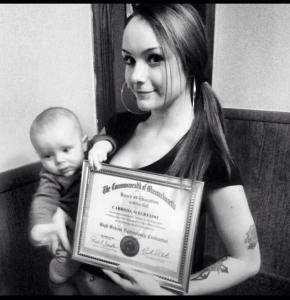 I am 18 years old, a single mom of a 5 month old baby, and I just received my GED. When I found out I was pregnant with my son, I dropped out of high school because I didn’t know what people were going to think of me. Being 17 and pregnant is a topic that everyone would talk about, and everyone would find out, especially when word spreads fast! After I dropped out, I went “on the run” because I lived at a foster home and my foster mother didn’t want to deal with a baby in her home. So I left. I stayed at my son’s father’s house for about 2 months and then we broke up and I moved in with my friend. I was mostly thinking about myself but then it hit me that I was going to be having a baby very soon. So I got my head straight and looked for help. My uncle is a police officer in Middleboro so I went to him to see what he could do. He told me about this Teen Living Program called the Ruth House in Brockton. I looked into it, thought about it, and then made one of the best decisions of my life. I went. While I was there, I got into a program called the Young Parents Program at Training Resources of America. It’s a program that helps young parents get their GED. I was there for about 3 months then I had left to move in with my father. While I was living with my father I took the first 2 GED tests at Cape Cod Community College. I was really hoping that I would be able to finish the tests before I gave birth, but it didn’t work that way. I was supposed to go the next day to finish it, but I was going into labor! After I had my son, I stayed home for about 2 months to take care of him. But after those 2 months, I left my father’s house because things weren’t going that well over there anymore. I went back to the Ruth House and told them I wanted to get back into school ASAP! I got back into TRA and went and took the last 3 tests that I needed to take in order to finish. If it hadn’t been for the staff at the Ruth House, my teacher at TRA, and my son, I don’t think I would’ve been motivated to get my GED. But they supported me and got me onto the right track. I’m so proud of myself because numerous people (family and friends) didn’t think I could do it and didn’t think that I was going to do anything with my life. But I did it for myself and for my son and that’s all that matters. I am now hoping to start college in January and get a great job so my son and I can have the best future we can have!